The Monthly Flower Gift Plan is a delightful way to bring beauty and happiness to your special recipient month after month! With this Flowers of the Month 12-month program, the recipient will receive their first flower bouquet with a beautiful glass keepsake vase. Future bouquets are shipped the same day each month. 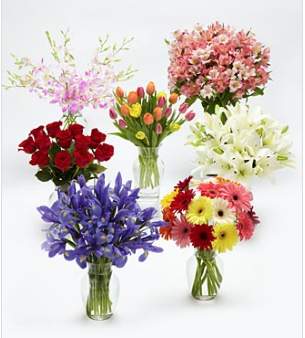 Each month they will be surprised with a new stunning bouquet or fresh potted plant. That way they receive the freshest, most seasonal bloom each month according to time of year. It’s a beautiful surprise each month! January = A mix of stunning blooms to start the new year off right! December = Winter bulbs featuring amaryllis and paperwhites. Your purchase includes a complimentary personalized gift message with each month’s delivery.